Saanvi Bahl: Doctor, working on cancer research, led to breakthrough on cancer treatment 5 years prior, right before the flight. Now seeing things. Kelly Taylor: Gave interviews with reporters, shot at end of episode 2. Dead. And now for this week’s episode … SPOILERS AHEAD! The episode begins on Montego Air Flight 828, five years ago. Cal is returning to his seat. A man is in the aisle speaking Bulgarian and asks Saanvi for help. She doesn’t understand him and tells him that she only speaks English. As Cal passes him, the man pats Cal’s head. A woman speaking Bulgarian says she can help the man. Present day. Grace and Ben awake as Cal is shouting in Bulgarian. 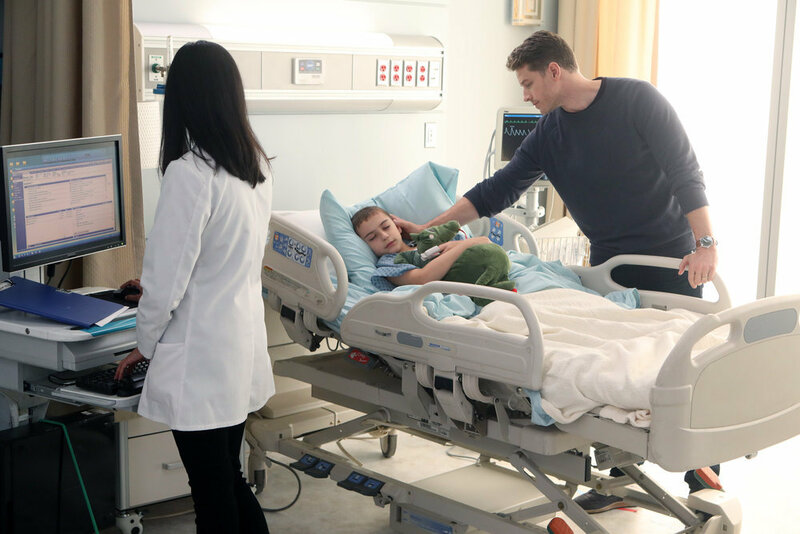 He also says, “not the red door.” Since he is running a fever, Grace and Ben take him to the hospital. At a panel full of scientists discussing what could have happened to the plane, Director Vance and his colleague are discussing if Detective Vasquez will be useful. Vance thinks he will lie to them, but he suggests finding enough dirt about Jared to make his life difficult. Michaela calls out of work for a personal day and Jared covers for her. She is at the hospital with Ben and Grace. The doctors can’t figure out what is causing his fever and ordered a full set of tests. Grace asks the doctor if the experimental treatment could be causing this reaction, but the doctor tells her that none of the other patients are experiencing symptoms like this. 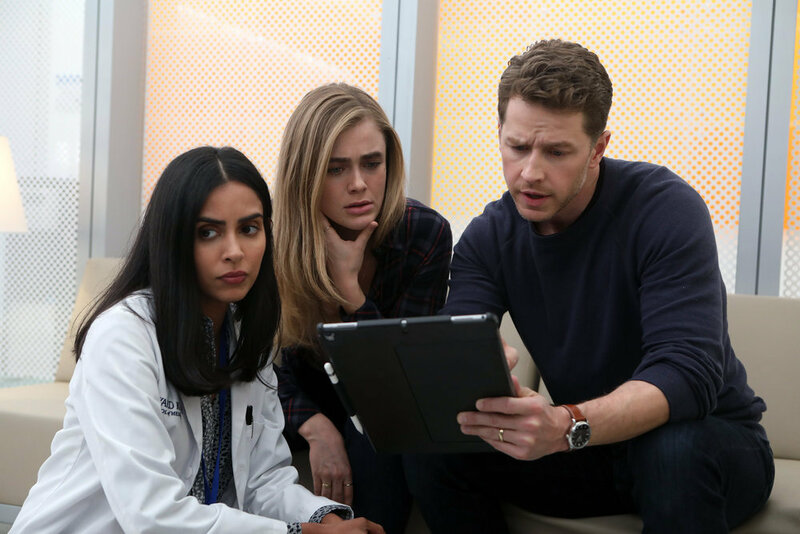 Ben, Michaela and Saanvi are discussing how they have had shared thoughts before and don’t believe that this is just a coincidence. Michaela asks Saanvi if she knew who the man was, but she didn’t know. When Ben pulls up a seating chart of all the passengers on the plane, Saanvi is able to point him out. Marko Valeriev (Nikolai Tsankov), the Bulgarian, is one of the people that Ben has not been able to find. As they are discussing why he hasn’t found some of the people, Michaela notices Fiona Clarke, one of the passengers, speaking on the television. Saanvi said that the woman behind her was able to help Marko fill out his custom forms. Anna Ross, is a translator and they set off to talk to her. At a motel, Michaela is talking to Anna (Jacqueline Antaramian). She tells her what Cal was saying and Anna translates that it means, “help me.” As Michaela explained that Marko was saying the same phrase, Anna tells her that he needed help translating in the hangar when they landed. Anna explains that when they left the hangar, if the people didn’t have a place to go, they went to government shelters. She watched Marko get on a bus to go to one of the shelters. Back at the hospital, Ben is on his cell phone with Michaela. When he hangs up, Grace asks why Michaela is tracking down a passenger on the flight and what it has to do with Cal. She asks what it is that he is keeping from her. Ben starts to explain that some passengers are seeing things and hearing things. When Grace asks Ben if he is hearing things, he doesn’t respond. Grace doesn’t want him to spiral out looking for answers to what happened on the flight. She wants him to be there for Cal. At the station, Michaela is checking NYPD duty logs with Anna from the night they were at the hangar. Jared sees her and asks if Cal is even sick. She tells him that Cal is sick, but won’t tell him what she is doing. Frustrated, Jared tells her that he doesn’t even care anymore and doesn’t want to know what is going on. Michaela goes back to Anna and the logs and sees that four buses were escorted to shelters. Anna corrects her, saying that there were five buses. Michaela is reading the log: one went to FEMA, one to a DHS facility, one to King’s Point and one to Fort Lee, NJ. Anna tells her that Marko needed help translating the instructions and that he was on that fifth bus. Ben is with Saanvi at the hospital looking at news footage that shows five buses leaving. He tells her that there are 11 people that supposedly walked out of the hangar, but he can’t find any information on them. All of the passengers that boarded that bus had no relatives or were foreign nationals. Cal begins to speak Bulgarian again and Ben translates it to “hurry.” Just as Cal repeats “hurry” in Bulgarian, we cut to Marko laying in a bed with wires connected to him, saying the same words. Michaela traces where the buses went and sees that they all went onto the thruway but one disappears after they exited. Saanvi helps Ben as he begins to search what is around where the buses exited. She becomes concerned that these callings may want them to do something that they don’t want to do, but Ben dismisses her concerns. He creates a map of places that could stash a bus and sends it to Michaela. Because he thinks the government is behind the disappearance of the bus, Ben suggests that Michaela takes Jared along for the ride. Reluctantly, Michaela asks Jared to go with her. He refuses at first, but then agrees. Back at the hospital, Cal begins to say, “make it stop, please. Not the red door.” The nurses can’t keep his temperature down. Cut to Marko laying in bed again with his fever spiking. Scientists are over his bed, saying that he is responding different than the others. They increase what looks like voltage for the experiment they are performing on him. Driving to upstate New York to check out places Ben mapped out, Michaela is with Jared. They come to one of the places that is large enough to hold a bus which also has security cameras and guards. The guards spot them and Michaela fakes having a flat tire. As they are leaving, Michaela starts to take pictures. Jared asks what is going on, but Michaela tells him to drive and she will explain later. Cal’s heart rate is spiking and he is not getting any better. The nurse explains that there might be an infection, but they don’t want to give him antibiotics without knowing how they will interact with his cancer treatment. After leaving the government site, Jared pulls the car over and demands answers from Michaela. She comes clean and tells him about hearing voices and seeing things. She also reveals that she is not the only one. Jared is not sure he believes her. 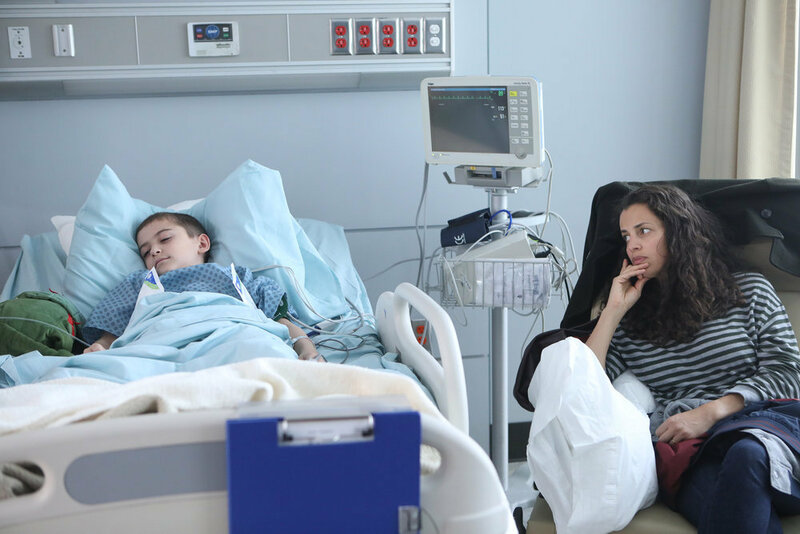 Wanting to hold off on the antibiotics, Ben tells Grace what he believes is going on. Grace doesn’t believe him. To prove his theories, Ben leaves the hospital to go to talk to someone. Grace is upset that he leaves. Ben goes to Director Vance with what he knows. Director Vance denies everything Ben brings forth. Vance asks his associates to pull files on the passengers because he can’t get answers from any of the other government agencies. Michaela is at her desk going through the pictures she took. Jared approaches and tells her that she could have told him this sooner. He tells her that she shouldn’t go back to the place and that she should just let the Feds take care of it, but Michaela thinks they are in on it. She traced the facility’s ownership to a company called Unified Dynamic Systems (UDS) and also traced the buses back to them as well. Back at the hospital, Saanvi is in the room with Grace and Cal. Grace asks her what she thinks about giving Cal the antibiotics. Saanvi feels Cal should continue with the trial. With another biased view, Grace feels that Saanvi sounds just like Ben. Cal’s heart rate begins to spike as Marko begins to seize. Grace wants to give him the antibiotics, but Saanvi talks her out of it. Marko and Cal come out of the seizure. Grace begins to break down as Cal comes to. At the facility that Marko is being held at, the scientists remove the wires they were testing him with and leave the facility. At Director Vance’s office, his associates contacted DHS and all 11 passengers have been accounted for. Still questioning the photograph that Michaela took, Vance goes to visit the facility. At the hospital, Grace tells Ben how upset she was with him for leaving her when she needed him. She asked where he went, but Ben won’t tell her. Michaela sits with Saanvi and Ben and tries to figure out how Cal got better, even though they didn’t save Marko. Saanvi thinks they might have been wrong about about the calling. Ben pulls out his computer and starts to look into UDS. Vance arrives at the facility to find it empty. His colleagues think Ben is putting them on, but Vance finds one of the pads from the experiments on the floor. At a new location, Marko wakes up and thinks he was at a hospital. One of the scientists is on the phone with a woman. He tells her that they had to stop the experiments because someone from the NSA was asking questions, but they will be back up and running soon. This was another episode where we have more questions asked, but get little answers. It will be interesting to see who (or what) UDS is and what part they play in this. Could the woman on the other line of the phone be Fiona Clarke? Does she have something to do with UDS? 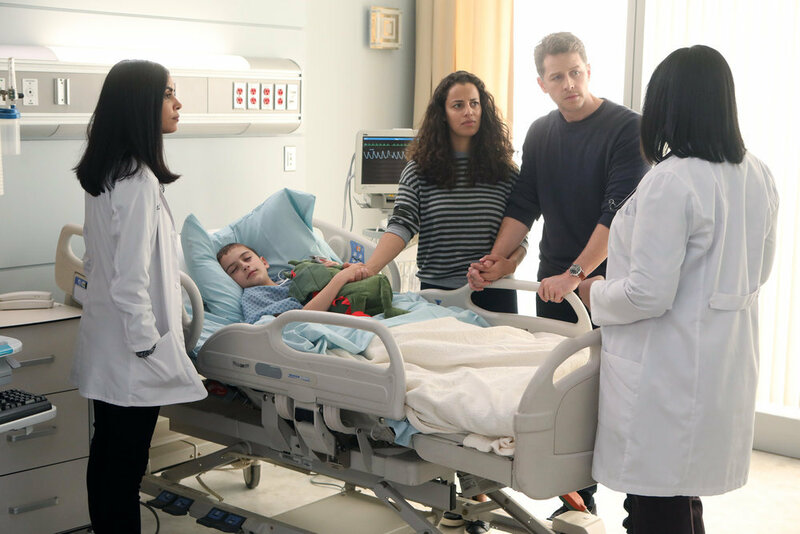 I am not a fan of Grace’s character yet, but I have to agree that Ben was wrong to just leave the hospital and visit Vance. All Grace wants is for Cal to get better, but she feels defeated. Both Grace and Ben have made terrible decisions so far, but they need to get on the same page when it comes to their children. It will be interesting to see whether we get to know more about the passengers that were on that fifth bus, or if they won’t be relevant to the story. Episode Score: I give this episode a 4 out of 5 Casey’s. The story is getting more interesting, but I hope it doesn’t fall down the path of constantly asking questions without rewarding us with some answers. Previous Previous post: TV Recap: The Masked Singer – Love It Or Leave It?